Constructed in the Northern Zhou dynasty, this cave consists of a main chamber, a corridor and a front chamber. The main chamber is square in plan and has a truncated pyramidal ceiling. In the center of the ceiling is a painted motif of laternendecke with lotuses and draperies extending to the four slopes. In the center of the west slope are a Lotus and a Mani Pearl flanked by six musicians and apsaras on either side. Below them is the niche beam decorated with motifs of flame, lotus and incarnated boys. The scenes on the south and east slopes form a complete Sattva Jataka. The scenes on the south slope mainly include the episodes of Prince Sattva leaving the palace, hunting, and taking a break. And those on the east slope include episodes of feeding the tiger and building a pagoda. Below are celestial musicians, six apsaras, and draperies. The north slope is devoted to the Samaka Jataka, which consists of the episodes of worshipping the blind parents (on the west side) and King of Kashi's hunting (east side). Below them are six celetial musicians and apsaras. The figures in the story paintings wore Chinese style attire, and the painting style inherited the tradition of the Central Plains. An arch niche is dug out of the west wall housing a statue of seated Buddha with legs pendent. Behind the statue on the wall is a nimbus consisting of a circle of manifested Buddha images, and a Buddha inside flames. Each of the upper side behind the Buddha are two apsaras holding music instruments and the lower side with two precious pearls. On the niche lintel in bas-relief are colorful flames and incarnated boys. The niche pillars are decorated with lotuses with a dragon's head on the top. On both north and south sides out of the niche are two bodhisattvas and two statues of bodhisattvas, only the lotus thrones are preserved today. Below the niche are lotus patterns.The south wall in the main chamber contains a preaching scene in the center surrounded by the thousand Buddha motifs, below which are yakshas (only two preserved). There is a bhiksu, seventeen male donor figures and a yakshas in the lower part on the west side, and twelve female donor figures on the east side. Some paintings on this wall were damaged due to a hole cut through the wall in the Qing dynasty. The murals on the north wall are symmetrical to those on the south wall: a preaching scene (half of it was damaged by the hole cut through the wall) amid the thousand Buddha motifs. The west lower part contains three bhiksus, fourteen male donor figures and a yaksha, while the opposite side contains eighteen bhiksus and eight donors. The space above the entrance in the east wall is divided into upper and middle and lower sections. The upper section on is covered with the thousand Buddha motifs, the middle section on the south side contains three female donors, chariots drawn by oxen and two attendants, while the middle one on the north side contains two bhiksus, and six male donors. Below them are three bhiksus and three male donors. The space above the entrance in the east wall is divided into a upper section and a lower section consisting of two parts. The upper section is covered with the thousand Buddha motifs, the upper part of the lower section on the south side contains three female donors, chariots drawn by oxen and two attendants, the upper part of the lower section on the north side level contains two bhiksus, six male donors. Below them are three bhiksus and three male donors. The south wall contains a central preaching scene surrounded by the thousand Buddha motifs, and below it are yakshas (only two preserved). On the lower part on the west side are an attendant bhiksu, seventeen male donors and a yaksha, while on the other side are twelve female donor figures (imcomplete). Part of the painting is damaged when a hole was cut through the wall in the Qing dynasty. An arch niche is dug out of the west wall. It contains a seated Buddha statue with two legs pendent. On the wall behind the Buddha statue is a nimbus consisting of a circle of manifested Buddhas and flaming Buddhas. There are two apsaras holding music instruments on each upper side (below them there were originally statues of attendant bodhisattvas, which have disappeared now), and on the two lower sides are pearls. The niche lintel is made in bas-relief with painted flames and incarnated boys. The niche beams have a dragon head on each end while the pillars are decorated with lotuses. The north wall contains a central preaching scene (half of it was damaged when a hole was cut through the wall in the Qing dyansty) surrounded by thousand Buddha motifs. On the lower part on the west side are three bhiksus, fourteen male donors and a yaksha, while on the other side are eighteen bhiksus and eight donor figures. The scenes on this slope continue the story painted on the south slope and describe the episodes like feeding the tiger and building a pagoda. Below are seven heavenly musicians and draperies. Both the south and east slopes are used for rendering the narrative Sattva Jataka tales. On the south slope are mainly scenes of three princes leaving the palace, hunting and having a break. Right in the center is a Mani pearl on a lotus flanked by six musician apsaras on either side. The lower part is connected to the niche lintel decorated with the flames, lotuses, and incarnated boys. The Samaka Jataka is painted on this slope, which mainly contains the following episodes: worshiping blind parents (on the west side) and King of Kashi hunting (on the east side). The lower part has celestial musicians and apsaras, six altogether. The figures in this narrative story wear Han Chinese styled attires, and the painting style mainly follows the traditions of the Central Plains. The ceiling center features a painted laternendecke motif with lotuses surrounded by draperies extending to the four slopes. There is an image of Kistigabha bodhisattva of the Five Dynasties on the space above the entrance in the west wall (the upper part is damaged). On the south side of the entrance is an illustration of the eleven-headed Avalokitesvara of the Five Dynasties (it is also on the north side of the entrance in the front chamber of cave 300. 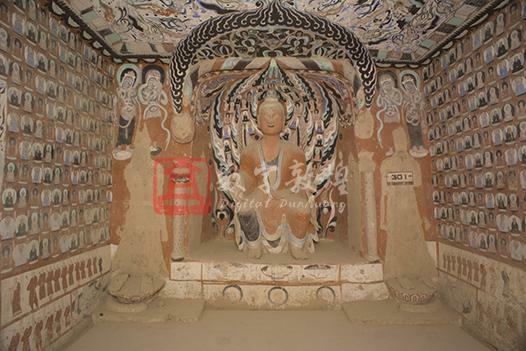 The paintings of the Five Dynasties on the north side have been destroyed.